Lucky Generals has appointed a leadership team to run its first international office in New York. 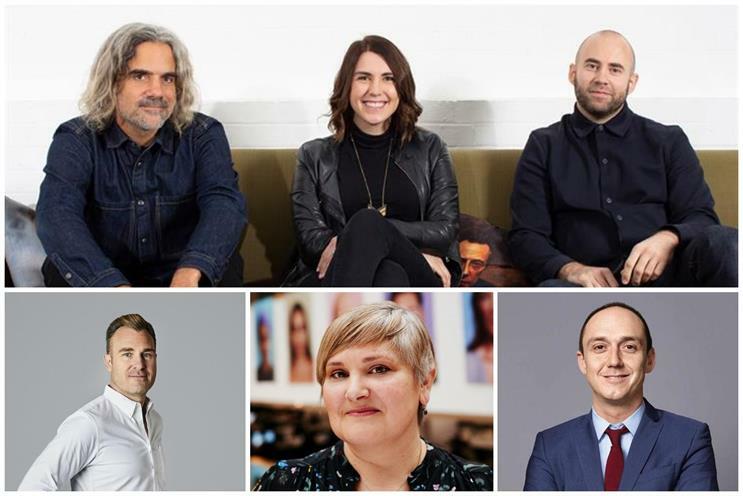 The shop, which is set to open in March, will be led by Augusto Sola as creative partner, Jess Roubadeaux as strategy partner and James Fox as managing partner. All three will report to founding partner Danny Brooke-Taylor. McCann London is working with headhunters to identify its next chief executive, with Alex Lubar set for a promotion within McCann Worldgroup. Lubar is likely to return to the US, where he has spent most of his career, in the second half of this year. Former Abbott Mead Vickers BBDO chief executive Ian Pearman is quitting advertising, two years after he left the London agency to become president of TBWA Asia. Pearman is joining a consumer services start-up with headquarters in Singapore. R/GA has hired Andre Le Masurier as chief creative officer, EMEA. Le Masurier is leaving Google Brand Studio, where he is executive creative director, at the end of April. He will be responsible for setting R/GA’s creative vision, overseeing work and bringing in talent across the region. Gyro London has appointed David Curzon as executive creative director. He replaces David Harris, who stepped down as UK chief creative officer in January. Curzon reports to Emma Rush, Gyro's UK president. Carat’s former global president, Will Swayne, has become global president of client solutions of the agency’s parent company, Dentsu Aegis Network. It is a new role that is effective immediately. Swayne continues to be based in London and reports to Peter Huijboom, chief executive of global clients and media brands. Meanwhile, Nigel Morris, one of the most senior and longest-serving executives at Dentsu Aegis Network, is leaving after 26 years. Morris was one of the architects of Aegis’ growth during the 1990s and 2000s, culminating in its £3.2bn sale to Japan’s Dentsu in 2012. Bartle Bogle Hegarty London has hired Martha Riley as its first head of creative. The new position will entail supporting chief creative officer Ian Heartfield in the career management, progression and well-being of the agency’s 100-strong creative department. Riley will also serve as senior creative director on some accounts. Channel 4 is looking to restructure its London-based agency-facing sales team into three groups. The broadcaster currently has four agency-facing groups of salespeople working in London. It also has a 25-strong commercial operation in Manchester. Helen Matthews has been promoted to chief people officer at Ogilvy UK. The agency said the position is a "newly defined role" in which Matthews will ensure Ogilvy has the "right offering and culture in place to attract, nurture and grow the best talent from across the industry and beyond". Tom Bureau, chief executive of Immediate Media, has been named deputy chairman of the PPA. A board member and part of the executive committee since 2012, Bureau will support the chairman, currently TI Media chief executive Marcus Rich. Starcount Insights has appointed Joanna Wardle to the new role of chief commercial officer. She previously worked as a freelance consultant and, between 2015 and 2017, was managing partner at OMD UK. Ingenuity London has named Rachel Langton head of connect. She was previously new-business director at Lock-In-Marketing. Greg Endean has joined extensible programmatic buying platform Beeswax as EMEA sales director. He was previously managing director at Singlespot. Dan Colley has joined VCCP Retail as executive creative director. He previously held the same role at Cherry London. VaynerMedia London has appointed Daniel Fox-Evans as group creative director. He has previously worked as a creative director at Leo Burnett and We Are Social. Copa90 has appointed Natalie Broad to the newly created position of partnership and media sales director. She was most recently sales director at Playbuzz.